the ways in which various members of the plant world influence human cultures. This inquiry ranges from the geopolitical impact of the European demand for spices (which helped to launch the Age of Exploration) to the role of hallucinogenic snuffs used by Amazonian shamans in religious rituals. Attributes such as creativity, reason, and curiosity, coupled with a desire to benefit others—attributes common in the scientific community—aids those studying ethnobotany to make important contributions. For example, the study of indigenous food production and local medicinal knowledge offers the promise of practical implications for developing sustainable agriculture and discovering new medicines. The term “ethnobotany” was coined in 1895, by J.M. Harshberger, an American botanist at the University of Pennsylvania. Modern ethnobotany is an interdisciplinary field drawing together scholars from anthropology, botany, archaeology, geography, medicine, linguistics, economics, landscape architecture, and pharmacology. Ethnobotany is considered a branch of ethnobiology, the study of past and present interrelationships between human cultures and the plants, animals, and other organisms in their environment. Like its parent field, ethnobotany makes apparent the connection between human cultural practices and the sub-disciplines of biology. Ethnobotanical studies range across space and time, from archaeological investigations of the role of plants in ancient civilizations to the bioengineering of new crops. Furthermore, ethnobotany is not limited to nonindustrialized or nonurbanized societies. In fact, co-adaptation of plants and human cultures has changed—and perhaps intensified—in the context of urbanization and globalization in the twentieth and twenty-first centuries. Nonetheless, indigenous, non-Westernized cultures play a crucial role in ethnobotany, as they possess a previously undervalued knowledge of local ecology gained through centuries or even millennia of interaction with their biotic (living) environment. The significance of ethnobotany is manifold. The study of indigenous food production and local medicinal knowledge may have practical implications for developing sustainable agriculture and discovering new medicines. Ethnobotany also encourages an awareness of the link between biodiversity and cultural diversity, as well as a sophisticated understanding of the mutual influence (both beneficial and destructive) of plants and humans. Why might plants have come to function as the material basis for human culture? The combination of their immobility (terrestrial plants must remain rooted in the soil) and tremendous production of cellulose makes plants a far more efficient and reliable source of building materials and food than animals. The biochemical diversity of plants, which contributes to their myriad medicinal and dietary uses, might also be traced in part to their immobility. Plants produce chemicals as a way of interacting with other organisms in their environment, either for mutual gain—such as enlisting animals in the transport of pollen or seeds—or as a mechanism of defense, to repel or poison predators or parasites. Modern societies depend on chemical agents in plants for 25 percent of prescription drugs and nearly all recreational chemicals, such as the caffeine in coffee, the nicotine in tobacco, and the theophylline in tea. 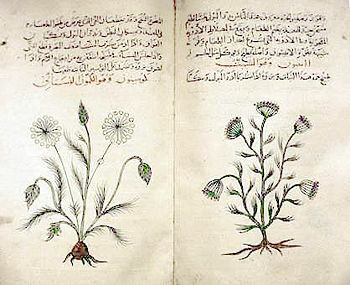 An Arabic edition of Dioscorides’s De Materia Medica (circa 1334) describes the medicinal features of cumin and dill. Although ethnobotany did not emerge as an academic discipline until the end of the nineteenth century, its roots extend back to Greek, Roman, and Islamic sources. In 77 C.E., the Greek surgeon Dioscorides published De Materia Medica, a catalog of about 600 plants found in the Mediterranean. This illustrated book of herbal (a book that describes the appearance, medicinal properties, and other characteristics of plants used in herbal medicine), which influenced scholars through the Middle Ages, contained information on how and when each plant was gathered, its use by the Greeks, and whether or not it was edible. (Dioscorides even provided recipes.) He also assessed the economic potential of these plants. However, the systematic study of plants was not confined to the West: The earliest known herbal was compiled by Chinese emperor Shen Nung sometime before 2000 B.C.E., and both the Incas of South America and the Aztecs of Mesoamerica maintained botanical gardens. The Renaissance in Europe saw a revival of interest in ethnobotany, which was intensified by geographic exploration and later colonialism. In 1542, Renaissance artist Leonhart Fuchs published De Historia Stirpium, a catalogue of 400 plants native to Germany and Austria. John Gerard (1545-1611/12) published the most popular of sixteenth century herbals, the General Historie of Plants, which remained in print for over 400 years. John Ray (1686-1704) provided the first definition of species in his Historia Plantarum. In 1753, the Swedish botanist Carl Linnaeus wrote Species Plantarum, which included information on approximately 5,900 plants. Linnaeus, known as "the father of taxonomy," is famous for popularizing the binomial method of nomenclature, in which all living organisms are assigned a two-part name (genus, species). The nineteenth century saw the peak of botanical exploration. Alexander von Humboldt collected data from “the New World,” and the famous Captain Cook brought back information on plants from the South Pacific. At this time, major botanical gardens were founded in Europe, such as the Royal Botanic Gardens, Kew (commonly known as Kew Gardens). The modern discipline of ethnobotany began to emerge in the late nineteenth century in part out of field-work concentrated in the north American West. Researchers referred to their work as "aboriginal botany," which studied the forms of plant-life used by aboriginal peoples. From the 1860s to the 1890s, Edward Palmer collected artifacts and botanical specimens from peoples in the Great Basin region and Mexico. Other scholars who analyzed the uses of plants under an indigenous/local perspective included Matilda Coxe Stevenson, Zuni plants (1915); Frank Cushing, Zuni foods (1920); and the team of Wilfred Robbins, J.P. Harrington, and Barbara Freire-Marreco, Tewa pueblo plants (1916). linguistic training to transcribe local terms and understand native morphology, syntax, and semantics. Ethnobotanists engage in a broad array of research questions and practices, which do not lend themselves to easy categorization. However, the following headings attempt to describe some of the key areas of modern study. 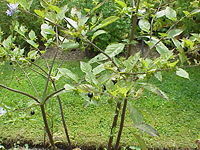 The drug atropine has its origins in Atropa belladonna (or "deadly nightshade"), pictured here. Ethnomedicine is a sub-field of medical anthropology that deals with the study of traditional medicines—not only those with relevant written sources (e.g., Traditional Chinese Medicine and Ayurveda), but also those whose knowledge and practices have been orally transmitted over the centuries. While the focus of ethnomedical studies is often the indigenous perception and use of traditional medicines, another stimulus for this type of research is drug discovery and development. Major pharmaceuticals such as digoxin, morphine, and atropine have been traced to foxglove, opium, and belladonna, respectively. Ethnomedical investigations in this century have led to the development of important drugs such as reserpine (a treatment for hypertension) podophyllotoxin (the base of an important anti-cancer drug), and vinblastine (used in the treatment of certain cancers). Agriculture may be defined as the culturally influenced selection of plants with specific genetic characteristics that are desired by humans to create domesticated plants, or crops. By revealing ways to create genetically altered plants for human purposes. By describing and explaining the many different ways the same crop can be raised, whether for economic gain, a desire for sustained yield, or other culturally specific purposes. One example of the mutual influence of plants and human cultures is illustrated by the Irish potato famine of the mid-nineteenth century. The Irish cultivation of potatoes was an example of monoculture, the practice of planting crops with the same patterns of growth resulting from genetic similarity. Monoculture can lead to large scale crop failure when the single genetic variant (or cultivar) becomes susceptible to a disease. The famine, which resulted in somewhere between 500,000 and one million deaths, was caused by the cultivar's susceptibility to Phytophthora infestans. The famine partially triggered widespread Irish immigration to Great Britain, the United States, Canada, and Australia. An entheogen, in the strictest sense, is a psychoactive substance (most often some plant matter with hallucinogenic effects) that occasions an enlightening spiritual or mystical experience. Entheogens have played a pivotal role in the spiritual practices of most American cultures for millennia. One of the founders of modern ethnobotany, Richard Evans Schultes of Harvard University, documented the ritual use of peyote cactus among the Kiowa who live in what has became Oklahoma in the [[United States). Used traditionally by many cultures of what is now Mexico, peyote spread to North America in the nineteenth century, replacing the toxic entheogen Sophora secundiflora (mescal bean). Indigenous peoples of South America employ a wide variety of entheogens. 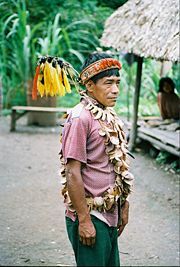 Better-known examples include ayahuasca (Banisteriopsis caapi plus admixtures) among indigenous peoples (such as the Urarina) of Peruvian Amazonia. Other well-known entheogens include: Borrachero (Brugmansia spp); San Pedro (Trichocereus spp); and various tryptamine-bearing snuffs. The familiar tobacco plant, when used uncured in large doses in shamanic contexts, also serves as an entheogen in South America. Folk classification refers to how members of a language community name and categorize plants and animals. This type of ethnobotanical study relies on an emic approach: That is, a description of behavior in terms meaningful (consciously or unconsciously) to the actor. The first individual to study an emic perspective of the plant world was Leopold Glueck, a German physician working in Sarajevo. His 1896 publication on the traditional medicinal uses of plants by rural people in Bosnia may be considered the first modern ethnobotanical work. Guila Naquitz Cave, site of the oldest known remains of maize. Archaeoethnobotany (or paleoethnobotany) is the study of the ethnobotany of the ancient past. It is closely linked to ethnobotany, as it is difficult to understand the ecology of modern environments without considering the environmental history that often involves prehistoric human interventions. The history of the domestication of the cereal grain maize (commonly known as "corn") is of particular interest to archaeoethnobotanists. The process is thought by some to have started 7,500 to 12,000 years ago. Recent genetic evidence suggests that maize domestication occurred 9000 years ago in central Mexico, perhaps in the highlands between Oaxaca and Jalisco. 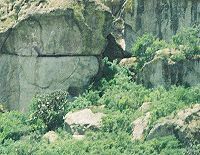 Archaeological remains of early maize cobs, found at Guila Naquitz Cave in the Oaxaca Valley, date back roughly 6,250 years; the oldest cobs from caves near Tehuacan, Puebla, have been dated to approximately 2750 B.C.E. Journal of Ethnobotany Research and Applications. This page was last modified on 14 August 2017, at 16:22.